2 cups of cooked quinoa wild rice blend or you can use just quinoa or wild or brown rice, I always cook my quinoa or rice in chicken broth it tastes so much better cooked that way). Cook onion and lean ground beef or turkey on medium high in a non stick skillet until onions are soft and meat is cooked. Put the cooked meat onion mixture on a plate and set aside. In the same skillet over medium heat pour in the marinaria sauce, beef broth, balsamic vinegar, and red pepper flakes into the skillet; cook and stir for 1 minute. Combine ground beef, diced tomatoes, Italian parsley, garlic, salt, black pepper, into bowl and mix well. Stir in cooked rice and Parmesan cheese. Stuff green bell peppers with beef mixture. Place stuffed green bell peppers in the baking dish with the tomato sauce mixture; sprinkle with remaining Parmesan cheese, cover baking dish with aluminum foil, and bake in the preheated oven for 45 minutes. 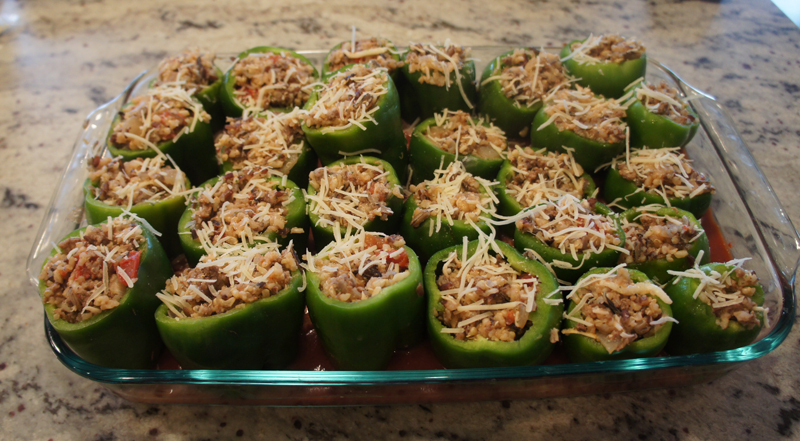 Remove aluminum foil and bake until the green peppers are tender and the cheese is browned on top, 20 to 25 minutes. *Those were peppers from my garden, store bought peppers will be a lot larger, I also used my big 15X10 inch baking dish I talk about in this post.